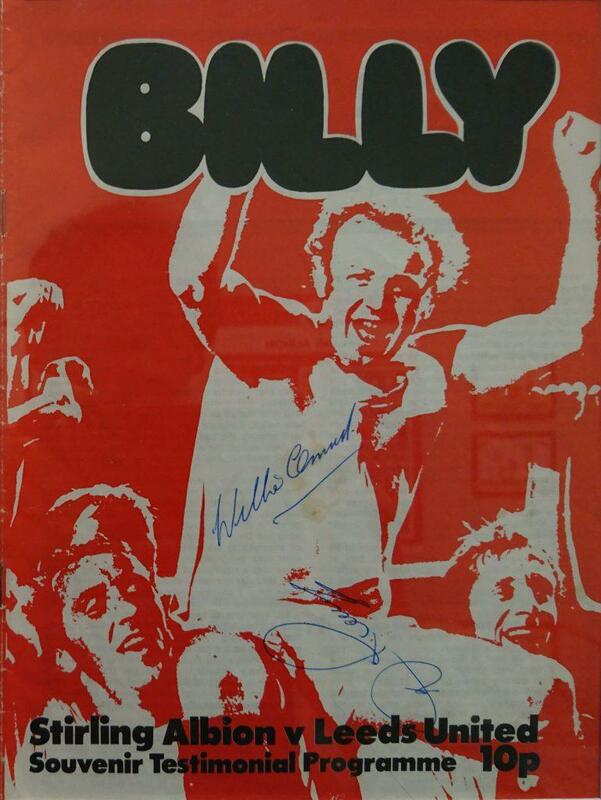 Shown here is Bremner’s Testimonial Programme for the match played in Stirling at Annfield on 30 October 1973. The programme was gifted to the Smith by Albion fan Jim Thomson, and before now, there has been nothing in the Smith collection to represent this great footballing hero. It is part of the exhibition on Stirling Albion’s ground breaking trip to Japan in 1966, when the team made history by being the first British footballers to play a match in Japan in the post war years. The exhibition continues until 31 July. The late, great Scottish Champion football mid field player, Stirling man Billy Bremner (1942 – 1997). His football career started in Govanhill United, and as a young man of 17 he was signed for Leeds United. He played for Leeds from 1959 – 1976, became captain of the team, and gave it a really successful time, winning a lot of silver. He was proclaimed Footballer of the Year by the Football Writers Association in 1970, and is Leeds United’s greatest player of all time. He served as Leeds Manager, (1985 – 1988), there is a statue of him outside the Leeds grounds. Bremner was a footballing legend in every sense. He is included in the Football League 100 Legends and is a member of both the Scottish Football Hall of Fame and the English Football Hall of Fame. He won more than 50 caps for Scotland and is on the Scottish national football team Roll of Honour. I remember being at the match – it was a big crowd. Leeds United fielded a full strength side and beat Stirling Albion 3-2 (they came from behind then ‘parked the bus’). This Leeds team were managed by Don Revie and went on to win the league in England that season. When they played Stirling Albion they hadn’t lost a game in any competition that season and in fact it was not until late February 1974 that they lost a game in the English league.